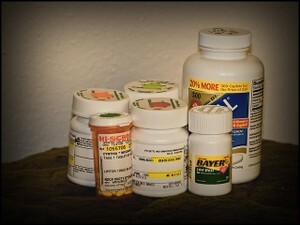 Many people underestimate the risks associated with the use of opiates like vicodin or OxyContin or stimulants like Adderall or Ritalin, but the reality is that these prescription medications are very similar in chemical profile, effects and risks to ‘street drugs’ like cocaine or heroin, and by the end of high school, about 1 student in 10 will have abused a prescription opiate to get high and 1 in 5 a prescription drug of some kind. Prescription drug abuse is a serious problem and recreational prescription drug abuse carries with it a serious risk of addiction, injury and even overdose death. Learn more about how and what and why teens are abusing and put into practice a couple of very simple strategies to minimize access and temptation in your own home. The Numbers – How Big Is the Teen Prescription Drug Problem? Amongst high school seniors, of the 14 most commonly abused illicit drugs, 8 are prescription medications (In order of use, Vicodin, amphetamines, tranquilizers, cough medicine, Adderall, sedatives, OxyContin, Ritalin). Only marijuana is abused more often than Vicodin. Why are they so easy to find? – In 1991, doctors wrote out 5 million prescriptions for stimulants. By 2009, that number had jumped to 40 million stimulant prescriptions. In 1991, doctors wrote out 45 million prescriptions for opiate pain killers – by 2009, that number had jumped to 180 million prescriptions. With such an increase, it’s no surprise that medicine cabinets coast to coast are filled with a lot of drugs that can get teens high. While you can’t hope to have your eye on a freedom craving adolescent every minute, there are steps you can take to minimize his or her access to strong drugs. Know what’s in your medicine cabinet and know how many pills a bottle of medication contains, especially medications that teens may seek to abuse, like opiates, stimulants or sedatives. Keep track of your refills, and if you find yourself needing to refill a prescription more often than you’d anticipated; you may have a problem. If your teen son or daughter uses medications like Adderall or pain medications, make sure to control his or her access to these medications. Since teens may have access to medications in the homes of other family members, make sure to also discuss the importance of monitoring medications with other family members. Lock your medicine cabinet, or hide strong medications where teens won’t find them. While you can't protect your teen from all access and temptation, by reducing access to strong prescription medications in your home and in the homes of other family members, you increase the odds of keeping your son or daughter safe from these very dangerous substances.